Hull City have recently been rocked by the departure of Steve Bruce but will still fancy themselves to threaten some of the more well established teams in the division. They have Premier League pedigree and with business still to be done they could yet strengthen an already talented squad. Edwards in action for Peterborough. Abel Hernandez was lethal last season ending the season with 20 goals in the Championship and a further two in other competitions. In the midfield they also have experienced operators in Tom Huddlestone and Jake Livermore. There is plenty of time for Hull to lure Welsh striker Hal Robson-Kanu to the KC Stadium before the end of August. Due to bouncing straight back up the players that were relegated are much the same and will know just how tough and unforgiving the Premier League can be. Hull are still looking for a goalkeeper keeping tabs on both Crystal Palace’s McCarthy and Cardiff’s Marshall. They are also leading the race for Robson-Kanu. They could also see another departure as fellow promoted club Middlesborough are interested in Harry Maguire. Leicester City…what a season! What a team! What a manager! What they did was incredible but now the hard work begins for Ranieri and his squad, the loss of Kanté is a blow but Leicester have a chance this season to become a big club. It is highly unlikely they will win the league again, they could though realistically achieve a place in the top seven therefore securing some form of European football. it is critical they push on and stick to the gameplan that served them so well last season. Jamie Vardy is a key player for Leicester. Leicester are a spirited side and Ranieri will have no problem bringing the team together to try and make Leicester a consistently strong side, this relies on two things, firstly keeping things simple and secondly not thinking about last season too much. As well as key departures they have made some really big signings, Ahmed Musa is lethal and him partnered with England striker Jamie Vardy and the Foxes should not be short of goals. With Riyad Mahrez still a target for both Chelsea and Arsenal there could yet be dealings to be done in the east Midlands. Leonardo Ulloa is also reported to be seeking a move but Leicester’s squad does seem to be looking close to finalised. Liverpool one of the most successful English clubs of all time blessed with great players and even greater managers. Klopp is now the man in charge following the sacking of Brendan Rodgers and with a whole pre-season behind him and his own transfers in the mix can Klopp fix the club? The squad is littered with internationals and young talent that can ignite the Premier League, this club clearly has ambitions to get back to where they once were as kings of Europe. Klopp is having an effect. Anfield is a wonderful venue and Liverpool need to match that venue with the quality of football and the German is building a squad to do that. They have recruited well stealing another Southampton player in Mané and also bringing in some cheaper recruits. A big spending summer sees two goalkeepers and two attacking midfielders arrive to bolster both attack and defence but they lose bright spark Ibe. Max Meyer is still a target for Klopp. Uncertainty still looms over the future of Mario Balotelli, Joe Allen, Brad Smith and Christian Benteke. Mané looks like a key signing. This entry was posted in football, Uncategorized and tagged abel hernandez, allen, anfield, balotelli, benteke, brendan rodgers, champions, edwards, europa league, firmino, foxes, german, henderson, huddlestone, hull city, kante, klopp, leicester city, leonardo ulloa, livermore, liverpool, mahrez, michael dawon, musa, peterborough, Premier League, ranieri, robson-kanu, sadio mane, smith, southampton, vardy, wales, wes morgan, wijnaldum. Bookmark the permalink. England have been dumped out of Euro 2016 at just the last 16 stage having been defeated 2-1 by Iceland in Nice. England did not deserve and more so they have shown nothing to suggest they are a good side over the course of what has been at best a mediocre tournament for most teams. England showed no desire, no bravery, no will to win. It was not good enough and has never been good enough. The players showed no willing to change the game to become heroes, they have come up against four teams all of whom showed more desire and bravery than England did. Roy Hodgson’s reluctance to play Jamie Vardy who has changed things every time he came on including the equaliser against Wales led to this. His dropping of Adam Lallana hurt England, his loyalty to Joe Hart lost the game, his faith in Raheem Sterling sealed England’s fate. Joe Hart has had his critics over the tournament. His resignation sums up England really, resigned, underachieving, overpaid. A team picked from a country approximately the same size as Leicester. Roy Hodgson leaves his post and that should improve England to an extent, it may bring excitement and pace to this England side. England need to look at the blueprint of what Eddie Jones has done to the national rugby team. Bring back England’s traditional strengths and bring through the young players, players like Lingard, Rashford, all of those players that Gareth Southgate had faith in. England have to start again drop the players that failed their country Hart, Rooney, Sterling, the new era is here and must be ushered in. This entry was posted in Uncategorized and tagged eddie jones, England, Euro 2016, hart, iceland, lallana, Manchester City, nice, rashford, roy hodgson, Sterling, vardy, wales. Bookmark the permalink. How Far Can England Go? England’s win over Wales on Thursday has made sure that their destiny is in their own hands and they won’t have to rely on other results to qualify for the next round. Following Slovakia’s win over Russia on Wednesday it has sent England to the top of their group. Hodgson has been heavily criticised for a number of reasons, firstly the fact that the Premier League’s most prolific striker, Harry Kane was taking corners and also the arguably negative approach that has been adopted over his tenure. Today though the former Liverpool boss has to be commended his decision to introduce Daniel Sturridge and Jamie Vardy at half-time proved to be inspired as both strikers scored goals to overturn the 1-0 half-time deficit. England have not done it the easy way conceding a late goal against Russia in their first game in Marseille and then having Gareth Bale give Wales a one goal half-time lead. The character shown today and the way all three substitutes (Vardy, Sturridge and Rashford) played are encouraging for England. England could well progress to the quarter-finals should this form continue. England should seal top spot this Monday when they play Slovakia in Saint Etienne. Wayne Rooney and his players will believe that should they play as they did in the second half and if Roy Hodgson does get his selection right then England could well impress a few people. This entry was posted in Uncategorized and tagged bale, England, Euro 2016, kane, marseille, Premier League, rashford, rooney, roy hodgson, russia, slovakia, sturridge, vardy, wales. Bookmark the permalink. Leicester City continue to defy the odds and top the Premier League ahead of all the giants despite having considerably less money than the likes of Manchester City, Manchester United, Tottenham Hotspur, Arsenal and Chelsea. Their success is something that does not seem to make any sense to football fans, they have all jumped on the Leicester to win the league bandwagon but because this sort of winning streak and defying the odds the way Leicester have is staggering. Especially in this day and age when the league table is more a rich list than anything else see the clubs languishing in the lower reaches are much poorer than the clubs leading the way this season. Leicester City manager, Claudio Ranieri. Whilst in international football the gap between the ‘haves’ and ‘have nots’ has been bridged, in domestic football (not just in England but across Europe) the gap is becoming wider. It is hard to say why Leicester are doing so well. But one factor has to be the fact Ranieri has established this spine of players that can keep the team going through the hard times. This spine consists of five key positions, a goalkeeper, a centre half, a holding midfielder, a wide midfielder and of course a striker. Look at the great Premier League teams of the past Arsenal had Henry, Vieira, Adams, Seaman and Pires. Manchester United had van Nistelrooy, Scholes, Ferdinand, van der Sar and Giggs. This is surely the formula to winning, this is the reason Ranieiri’s Leicester are leading the charge and Arsenal have struggled for domestic titles over the years. Leicester City are built around the stars they have in Robert Huth, N’Golo Kante, Riyad Mahrez, Kasper Schmeichel and Jamie Vardy are the spine that make this team the successful side it is. 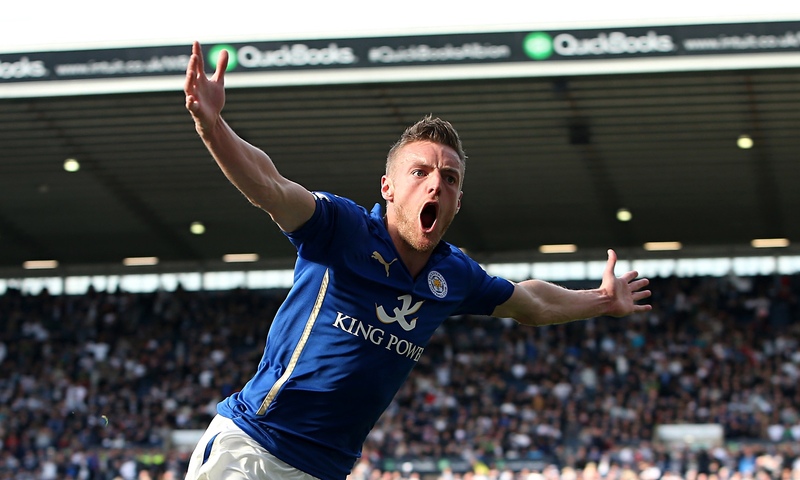 Vardy celebrates scoring a goal for Leicester City. Unfortunately it looks as though at least one of those sought after players will be leaving the King Power Stadium come the summer transfer window. The loss of these players could be their undoing but whilst it lasts it is to be admired and adored. It is not often we see teams like Ranieri’s make an impression at the very highest reaches if English football. This entry was posted in Uncategorized and tagged Arsenal, football, leicester city, Manchester City, Premier League, ranieri, vardy. Bookmark the permalink. Will Roy’s Boys Roar in France? The Euro Championships are always a great occasion for all football fans over the continent. England travel to France in June with a raft of new players likely to be in the mix since the previous Euro’s back in 2012 which prompted some soul searching following an indifferent campaign. With the likes of Jamie Vardy banging in the goals this season for Leicester including of course surpassing the record of the great Manchester United striker Ruud van Nistelrooy. The emergence of Liverpool midfielder Jordan Henderson has also looked promising as he is becoming a well rounded captain. His passing game and control make him invaluable to Klopp’s new Liverpool and if he can finally make himself an England regular we could start to see England reap the benefits of Henderson. The young Jesse Lingard has been a really exciting player to come through the ranks up at Old Trafford and his stunning rise saw him earn a call-up to Hodgson’s most recent squad. Add in to the mix a host of young stars in the under-21’s Loftus-Cheek, Redmond, Chambers, Ibe, Ward-Prowse and Targett all looking to break into the top squad having made themselves regulars at their respective clubs. Jordon Ibe celebrates scoring pre-season. England have been drawn in a group that is certainly winnable with ties against Wales, Slovakia and Russia to look forward to in France. Games against Slovakia and Wales shouldn’t be too much of a problem despite the undeniable talent of former Spurs key player, Gareth Bale. Russia’s talented squad could prove a slight problem for England though. The road to Paris so far though has been as smooth as you like with England bagging a 100% win record in their qualifying group, admittedly the likes of San Marino, Lithuania and Estonia are nowhere near the likes of a nation obsessed with football such as England. Greg Dyke has issued a warning to Roy Hodgson saying that England have to get out of their Euro group and I for one would agree, if England fail to emerge from what is a relatively simple group questions will have to be asked about the coaching staff and players. Roy Hodgson has been issued a warning by the FA. This entry was posted in football, Uncategorized and tagged Chelsea, England, euro, fa, france, gareth bale, ibe, klopp, liverpool, Premier League, roy hodgson, russia, slovakia, van nistelrooy, vardy, wales. Bookmark the permalink. Leicester City have played some great football last season only winning 2 games pre-Christmas. The transformation after Christmas was huge and played some wonderful football after Christmas. Leicester have a squad full of stars that if they perform can make a go of qualifying for European football. A stunning 5-3 win over Manchester United was a wonderful game to watch and and 1 that I will remember for some time to come. Leicester showed some pace and slick movement to beat Van Gaal’s hapless Reds. They also enjoyed impressive wins over Newcastle (3-0) and QPR (5-1) that showed the rest of the league that they can be a very clinical side they managed to net 46 times over the course of the season although they conceded 55 goals in the process as well but the promoted side put in a good season under Nigel Pearson and it is a shame that scandal swept through the club costing the manager his job. 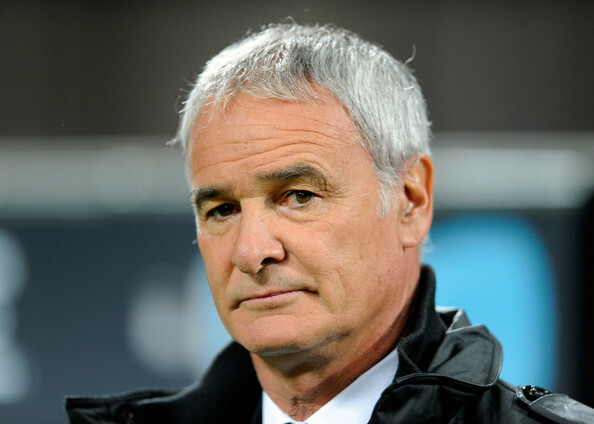 However Ranieri is an accomplished professional and could raise Leicester to new heights. Ranieri has enjoyed spells at a number of top clubs including Chelsea and Inter Milan. Throughout April and May Leicester only lost 1 game and that was champions Chelsea, they also only conceded 7 goals in that time 3 coming in the 3-1 loss to Chelsea. They finished with a flourish, they would have been hoping the season would never end as they built up a head of steam and started to look the real deal throughout the Spring. They have some very strong players in attack with the likes of Vardy who earned himself an England call-up after a strong season for the Foxes. Jamie Vardy can be a great finisher and proved that on multiple occasions he has plenty of partners such as Nugent, Ulloa, Kramaric and Okazaki all of whom can finish. Leicester have very big boots to fill after Argentine legend Cambiasso announced he will not renew his contract at the King Power Stadium. Esteban Cambiasso was named Player of the Season for Leicester last season and it is unclear who will replace even though Ranieri has said he will sign a replacement. They will hope to build on their return to England’s top tier and look to score like they did last season. They should have no problem avoiding relegation the question is by how much? Jamie Vardy is a key man for Leicester as is Schmeichel who has been a rock in between the sticks always a key position for clubs looking to avoid going straight back down. The son of the legendary Manchester United keeper Peter is finally stepping out of his father’s shadow as a Leicester City star. He will be key again this season, the goalkeeper will hope he can keep Leicester playing well and hold off the challenge of 42 year old veteran Mark Schwarzer who has played for multiple Premier League clubs. 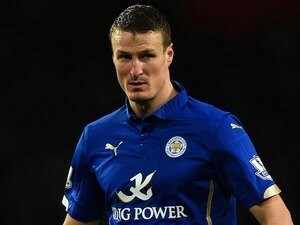 Robert Huth is a very good signing for the midlands club and his Premier League experience will be invaluable. Huth should be able to play a big part in Leicester kicking on as a Premier League side. The signing of Japanese striker Okazaki has made 93 appearances for his country netting 43 goals and at Mainz he scored 27 goals in 65 games. A very good finisher and sure to add some more firepower to an already powerful strike force. Leaving King Power Stadium are some players that weren’t making waves bar Cambiasso who was huge for Leicester City. Knockaert has been at Leicester a while and made 93 appearances for the club scoring 13 goals as he leaves for Standard Liege. Leicester have also have offloaded Chris Wood who spent a lot of time on loan whilst he was at Leicester his move to Leeds sees Leicester lose a promising striker. Leicester City will be a hugely challenging prospect at times over the course of the season. It could be quite a tough challenge to go to King Power Stadium with a team that has big aspirations and a squad full of names that any self-respecting football fan knows add to that a couple of promising youngsters and there you have a team that can go places. This entry was posted in Uncategorized and tagged 13, 14th, blues, cambiasso, Chelsea, city, England, europe, football, foxes, huth, king power, kramaric, leeds, leicester, mainz, manchester united, newcastle, nugent, okazaki, pearson, qpr, ranieri, reds, schmeichel, schwarzer, standard liege, striker, ulloa, van gaal, vardy, wes morgan, wood. Bookmark the permalink.